Global Rail Sdn Bhd and its partner from China are working on a RM5 billion project to lay 250km of parallel railway lines in southern Peninsular Malaysia.The proposal for the double-track lines, connecting Gemas and Johor Baru, will be submitted to the Ministry of Finance and Transport Ministry by early June, Global Rail managing director Fan Boon Heng told Business Times. Its partner is China Infraglobe Consortium, a state agency under the Central Committee in Beijing.The rail project will be a Private Finance Initiative, where the developers will arrange funding, and it will also include a plan by China Infraglobe to invest in mineral processing and metal production in Johor. Global Rail is part of an international team of specialists undertaking a detailed development and investment study for China Infraglobe.The Chinese company wants to set up an industrial complex in Johor to process the mineral and for downstream metal production with the required logistics infrastructure. The proposed investment by China Infraglobe is related to the processing of minerals sourced in Peninsular Malaysia with electrified rapid rail freight, connecting the southern ports to the complex, Fan said. "A proposal on the plan by China Infraglobe will also be submitted to the Chinese government early next month for approval," Fan told Business Times in an interview. China Infraglobe is the implementation arm of the Byzantium China International Investment Consortium, both of which are extra-jurisdictional agencies under the Central Committee in Beijing. "Our aim is to provide a solution to link up to Iskandar Malaysia, which is fast developing. There is a single track up to Johor currently but that needs to be upgraded. Furthermore, the government has indicated the continuation of the double tracks from Gemas to Johor," Fan said. 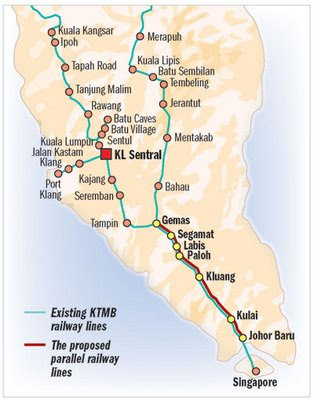 The Gemas-Johor Baru double-tracking project will benefit Keretapi Tanah Melayu Bhd as it will be able to extend its commuter services to Johor, instead of making its last stop in Seremban.India's national railway firm, Ircon International Ltd, is already working on a RM3.45 billion contract to build 100km of electrified double-tracks from Seremban to Gemas.Ircon's design-and-build contract is fully funded by the government and will be implemented in four years. Huhuhu... No more train crossing moment at Sedenak anymore!! I would surely miss 'em! 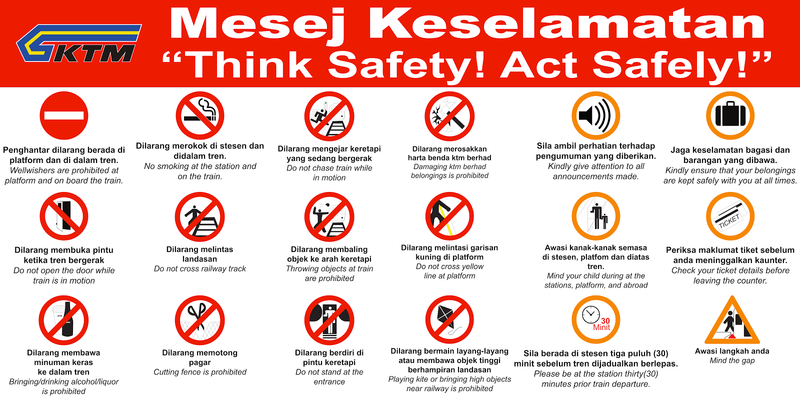 No more level crossing at Saleng, Sengkang, Rengam, Kluang and definitely Segamat!!!! Wargh! The tracks scenery won't be like now! Everything will be like Japanese look! Too bloody modern! Aiyarghh! Those iron steel truss bridge surely will be demolished and replaced by not-so-good-looking plain-jane concrete bridges. Huhuhu! Another good news..? Probably the ticket fare got hike? Good news to KTMB, yes! This blog was established by an individual and not of any organization or selected company. Simple theme. Powered by Blogger.